Dolly Oblong is a crafty designer who creates cute quirky characters in all shapes and sizes, preferably while drinking tea and munching away cookies. The colourful world of Dolly Oblong is 100% handmade out of plush, paper and occasional bits of vinyl. The main concept behind all Dolly designs is keeping it simple and sweet, with a twist! Plush have been part of the Plush You! show and paper toys have been showcased at Urban Paper shows from Tokyo to Los Angeles. 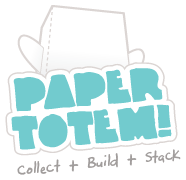 With the Paper Totem! project Dolly has collaborated with artists and designers worldwide.